It is one of the wonders of language: We cannot possibly anticipate or memorize every potential word, phrase, or sentence. Yet we have no trouble constructing and understanding myriads of novel utterances every day. How do we do it? Linguists say we naturally and unconsciously employ abstract rules—syntax. correct distorted words in digitized books. What’s the News: Nothing…yet! But word is that Luis von Ahn–the Carnegie Mellon professor behind the clever projects reCAPTCHA and ESP Game–is bringing his crowdsourcing know-how to bear on the problem of web translation. With Duolingo, a project his lab has been working on for the last year and a half, people learning new languages will serve as translators. How well will that work? It remains to be seen, but according to von Ahn, a private beta version should be launching in several weeks. “The solution was to transform language translation into something that millions of people WANT to do, and that helps with the problem of lack of bilinguals: language education. It is estimated that there are over 1 billion people learning a foreign language. So, the site that we’ve been working on, Duolingo, will be a 100% free language learning site in which people learn by helping to translate the Web. That is, they learn by doing. With reCAPTCHA, the distorted words you have to identify before making an online purchase, posting a comment, and so on are drawn from digitized books. Computer algorithms trying to correct glitches in the scanned text can’t tell what the words are, but humans can. So with each purchase, you’re helping books go online. In ESP Game, users are presented with images to tag as part of a game. The result: when you search for images online, the results correspond to what you’re looking for. The Future Holds: A private beta version, for starters: You can sign up to be notified on Duolingo’s progress here. The vision was set out in Life magazine in 1961 by Dr John C Lilly, an American physiologist, who was pictured at his laboratory in white shirt-sleeves with a microphone pressed against the blowhole of a young dolphin called Elvar. Lilly was partial to hallucinogenic drugs and championed the recreational use of isolation chambers meant for sensory deprivation studies, but he also held a rare passion for dolphins. He devoted much of his life – and no fewer than five books – to the animals and dreamed one day of creating a common language we might use to converse with them. He even sketched designs for an aquatic lounge, where pods and people could meet for a natter. And all for good reason, Lilly argued. Together, side-by-side with our marine mammal comrades, humans would be invincible. Or at least better at measuring ocean currents, collecting spent nose-cones from space rockets and fishing. 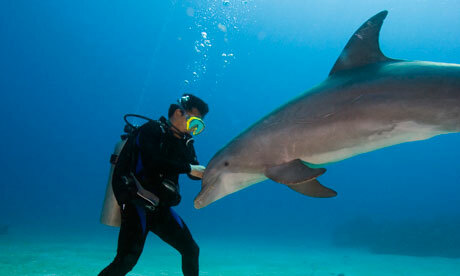 “No human is as good at detecting, tracking, herding and catching fish as dolphins are. If we could get their cooperation, the whole fishing industry might be revised,” he wrote.